Alison Bruce has an honours degree in history and philosophy, which has nothing to do with any regular job she’s held since. A liberal arts education did prepare her to be a writer, however. She penned her first novel during lectures while pretending to take notes. She writes mysteries, romance, westerns and fantasy. Copywriter and editor since 1992, Alison has also been a comic book store manager, small press publisher and web designer in the past. She currently manages publications for Crime Writers Canada and is a volunteer with Action Read Family Literacy Center. A single mother, she lives in Guelph, Ontario with her two children, Kate and Sam. Why would a Canadian set her story in Texas? Blame it on Mexico. My sister and I had whooping cough. I was five; Joanne was two. She was the reason we had to seek out a warm, dry climate for Christmas instead of visiting family in Montreal. Since my parents weren’t exactly flush with funds, they packed up my fat her’s company station wagon and we drove south, headed for Mazatlan. With the self-centered clarity of a child, I only remember the parts of the trip that had an impact on me. I remember the switchback roads in the mountains. Dad loved them. Me – who was car sick on a straight road – loved them. Mum and Joanne were throwing up. When we reached the beach, I stepped on a crab and was scared of the sand for years after. I remember eating peeled shrimp like candy… and my first real pineapple. For some reason, I also remembered Laredo. I don’t remember much about the town except the name. It etched itself on my consciousness, the sound of the word was as exotic and exciting to me as Paris or Istanbul might be to someone else. Travelling to Mexico became a family habit for a while – especially after we acquired a camper. It was in the camper that I started reading Zane Grey and Louis L’Amour. I had run out o f Georgette Heyer and had not yet developed an interest in the mysteries my mother brought along for the trip. Dad gave me a copy of Riders of the Purple Sage, followed by a couple of L’Amour’s short story collections. Suddenly I started taking an interest in the country we were travelling through. The United States – particularly Texas – ceased to be a geographic obstacle between home and our destination. When I needed to research Texas history and geography for Under A Texas Star, memories of those trips floated up to the surface. One other trip cinched the deal – but it wasn’t one I took. My parents decided to go to Mexico when my mother retired. The family camper was long gone. Instead they outfitted a van with a kitchenette, bed and porta-potty. Feeling a bit envious, I wished them bon voyage one chill November morning. A couple of days later, they called from the Mexican border. They had forgotten the vehicle permit. They couldn’t get into Mexico. Stifling a laugh that I would have paid dearly for, I suggested they visit Texas while they were there – and bring back guide books. I was writing a western. Over the years I’ve developed a great interest in the Texas Rangers and their history, especially in comparison to our Canadian Mounties. The Rangers are legendary. Their history goes back to the early years of the American colonization of Texas when Stephen F. Austin hired ten experienced frontiersmen as rangers for a punitive expedition against a band of Native Americans. 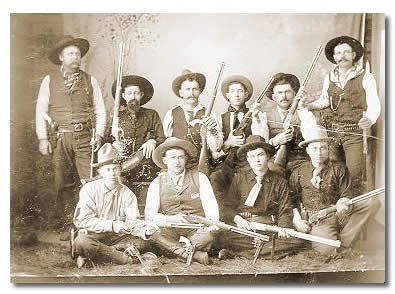 In 1835, the Texas Rangers were formally created as a law enforcement and defensive organization. They fought for Mexico against Spain, against Mexico for independence, then against the United States for the Confederacy. Organized into companies that were given the task of protecting and keeping the peace in their bailiwick, the Rangers were a paramilitary, ununiformed group. Many didn’t even have badges. There was no uniform badge until 1936 – a hundred years after the official formation of the Rangers. As peacekeepers and lawmen, their star rose in 1874 with the formation of the first Special Force of the Texas Rangers by Captain Leander McNelly. This became the force that was immortalized in fact and fiction. With the Treaty of 1846, the 49th Parallel was established as the border between the United States and British-Canadian territories in the west. For almost three decades, the border wasn’t recognized by trappers, traders or natives. 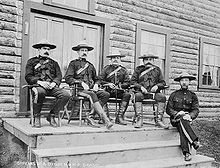 Then, in 1873, the North-West Mounted Police were established to police the Northwest Territories. This included what would become Manitoba, Saskatchewan and Alberta. Modeled on the Royal Irish Constabulary, the Mounties recruited men of good character, able to speak and read English or French. No married men need apply. Unlike the Texas Rangers, who were recruited from settlers already in country, the Mounties migrated west ahead of the European and eastern Canadian pioneers that would follow. Where the Rangers were initially recruited to fight “Indians” and outlaws, the Mounties were sent west to protect the natives as well as secure Canadian sovereignty in the territory. The Mounties were a uniformed force. 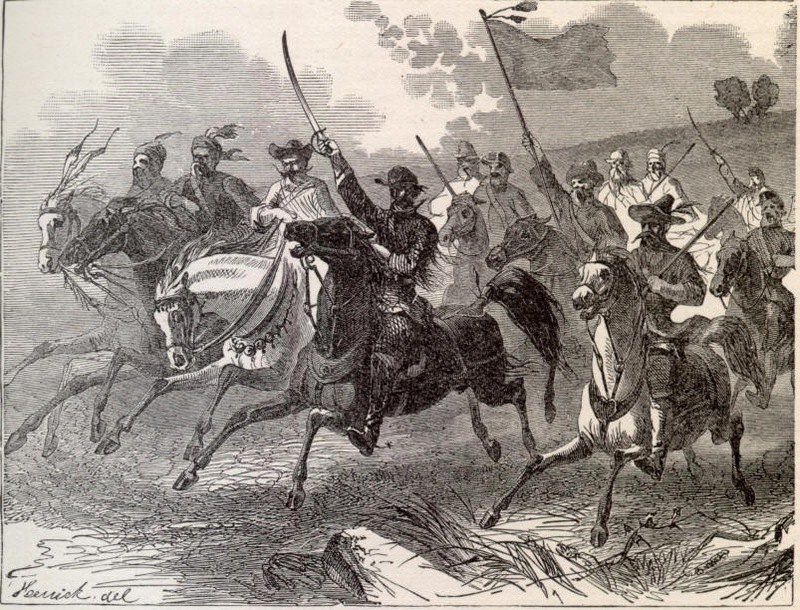 Many were former British Regulars or Colonial Militia soldiers. The officers included other professionals. The enlisted men included farmers, tradesmen, clerks, two policemen and a bartender. Over a third of the original force came from Ontario. Others came from Quebec and eastern Canada, Britain, Ireland, Europe and even the United States. Regardless of the differences in their origins, the Texas Rangers and Canadian Mounties share significant similarities. Both organizations were tasked with keeping the peace with small forces in impractically large territories. Both were divided into battalions or troops that served their areas from a local base of operations. Both were more than police forces. They also served military and judiciary roles. Both are the stuff of romantic heroes of the old and new west. Thanks for reading my post and thank you, Lyn for hosting this wonderful series. Hosting you and our other talented blogging sisters has been a great pleasure. Let’s keep in touch! Yes, you can find texas druids on twitter and my Lyn Horner fan page on facebook. Thanks for visiting. Really enjoyed your article, Alison. 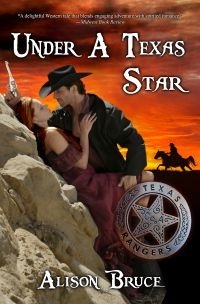 I love the romance of the old West and I can definitely see the parallels between the Canadian Mounties and the Texas Rangers. (really ejoyed watching Chuck Norris in that too, lol ) You are a new author to me, so will have to look into your work.